The University of Cologne (UoC) India Branch Office in New Delhi was opened in 2009. It serves as a first point of contact for faculty and students both in India and in Cologne. The office organizes UoC delegation visits, summer and winter schools, workshops, conferences and seminars in India. The office also aims to reach out to the University’s network of Indian and German alumni. Further, the office cultivates relations and new partnerships between UoC and Indian Institutes of Higher Education. The UoC India office also assists on providing internship opportunities and short term study-abroad in India to German students, during and after their study. The UoC India office is a member of the German House for Research and Innovation (DWIH) along with 15 German organizations having branch and liaison offices in India (www.dwih.in). DWIH promotes research and study activities among Indian Institutes of Higher Education and through its regular annual funding enables the DWIH consortium members to have more visibility in the Indian research landscape. The University’s representative in India is Dr. Amisha Jain. A lawyer by profession, she holds a Doctorate of Law in the study of the rights of Indigenous people of India. Dr. Jain visits Cologne every year in June to participate in the Cologne India Week, where she meets UoC professors who are keen to establish liaisons with Indian institutes of higher education. Her role is to prepare the annual strategy of Indian academic activities and to inform about the latest research landscape and education policies in India. She is responsible for fostering Indo-German research collaborations and looks after already existing exchange programs with Indian institutes of higher education. The UoC India Office is the second international office of the University of Cologne after Beijing, China (2007) followed by New York, USA (2011). 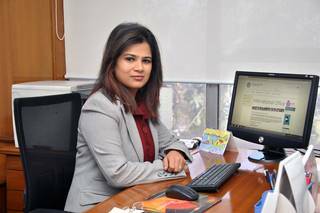 Dr. Amisha Jain (Ph.D., Law) is the Head of the University of Cologne India Branch Office since its establishment in 2009. She is an Advocate and a registered Solicitor of the Supreme Court of England and Wales (UK). She lived in Germany from 2006-2009 and worked in the international law firm Osborne Clarke in Cologne.